It's on the north side of Vieques, Puerto Rico, a few miles from the island's main town of Isabel Segunda. You have to park you car and walk half a mile down the beach, which is almost always empty, especially in the morning when the fish seem to tail the most. It's not a big flat, about the size of two football fields, and it doesn't hold a lot of fish. There's a resident school that calls it home and sometimes you'll see two or three dozen tails, but usually less. They're spooky but no worse than the bones in the Keys, even though the locals don't fish for them because they're not good to eat. 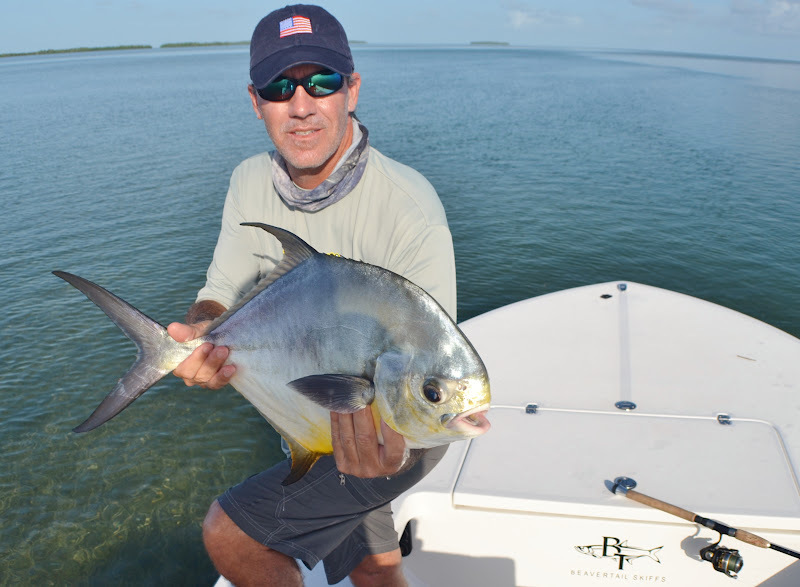 You can sometimes spot a permit there, too, but always further out by the reef where the waves are breaking and it's too dangerous to wade. Permit are like that, just a bit too smart when someone with a fly rod is in the neighborhood. Sometimes the bonefish on this flat are that smart, too, but not all the time. If you get there just after the sun rises and stand real still about fifty feet off the beach, the school will be there. Your fly has to be small and light.and you might only get one good shot but if you put it right on them they'll eat. You have to stip quick and it's a mad rush once they once they spot the fly but one always finds they hook. 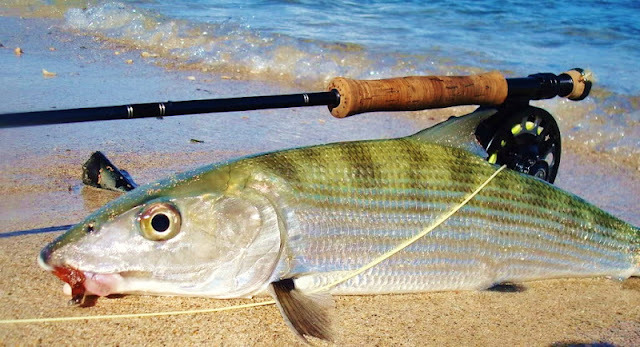 The next few minutes are typical bonefish, screaming drag, furious reeling, exhausted fish at your feet. No different on this flat on Vieques than one in the Keys or the Bahamas or Belize or the Seychelles. There aren't many sharks in this part of the Caribbean so that's a bonus when you watch your fish swim away. The school usually spooks after one gets pulled from the ranks and that never really bothered me. My fishing was done and I'd walk back up the beach and be home in time for breakfast. Big morning tides and calm winds have had these guys rolling everywhere this past week. They're hanging in the deeper canals and by most of the docks surrounding Pine Island and they become incredibly active at night. I've heard from a few different anglers who've really crushed the tarpon after midnight around the construction barges off the Matlacha Bridge. In the daytime it's a different story and usually refuse to eat anything, even live bait. My buddy Don Moorehead landed the ten pounder pictured above with a white paddletail jig on one of his Keystone Custom Rods. We threw at these fish, which were rolling by the dozens near the bridge, for almost an hour yesterday and this was the only one we landed. They good news is that they'll be here for the rest of the summer and well into the fall. The Discovery Channel was here on Matlacha for a week back in April to film the pilot episode of their new fishing show Off The Hook: Extreme Catches. 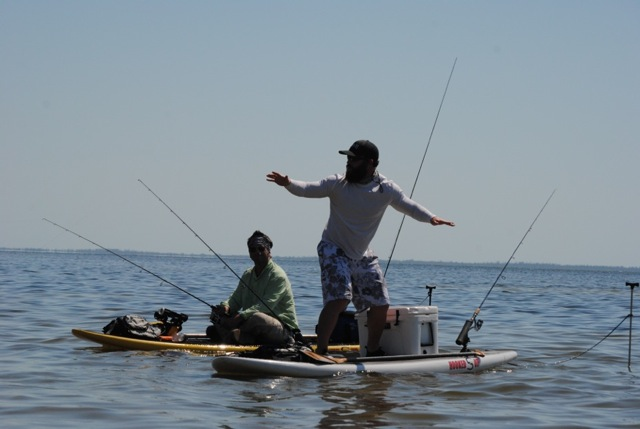 The show airs this Monday at 9:30PM and features my buddy Jory Pearson of Florida Paddlesports fishing with their hilarious but dangerously unskilled, pro-wrestler host Eric Young off of stand-up paddleboards for sharks in Pine Island Sound. Be sure to set your DVR for this one. It will also air again on Animal Planet, the show's home channel, on August 9th. This one came out two years ago and it somehow slipped by me. You can order the full length DVD or Blu Ray here. My buddy Mike Shelton has just opened a great tackle shop that covers everything for both inshore saltwater and freshwater bass fishing. The Crazy Lure is located at 4839 Vincennes Street in Cape Coral. This is right next to the new West Marine and their prices are lower. Local angler Len Favara was out with me on Friday throwing at tarpon in Pine Island sound. We didn't get any takes from those fish but he did pull in a couple nice sea trout on his Black Death pattern. I seem to always land big trout every time I'm throwing a tarpon inshore. A nice bonus when you can't land a silver king. Actually, the reds really didn't go anywhere, I just had a hard time finding them last week during the falling tides. It seemed like the early high tides in Matlacha Pass over the weekend were really kicked them into gear for my anglers. Since we had enough water to go anywhere I wanted, I ran up some of the smaller creeks where fewer boats travel. I've always liked wrestling big fish out of the mangroves and we brought several upper slot redfish to the boat last week. The beautiful 27 incher pictured about was landed by Alabama angler Jim Stenson on a white Gulp Shrimp. This was the biggest of three reds he and his buddy Mark landed on Sunday. The guys also landed a handful of trout and a small snook to complete the Slam that morning. We've got great tides all week so this action should continue as long as the thunderstorms leave us alone. Summer is all about tarpon and I spent the majority of last month chasing some very big fish off the beaches of Cayo Costa and Gasparilla Island. There were thousands of them rolling through the beautifully clear waters out there on their way to Boca Grande Pass and through Charlotte Harbor. I had several very experienced fly anglers on my bow but only a few of them actually managed to stick a hook into a tarpon. We were not alone in our frustration. At any given time there were at least a dozen other boats within half a mile of us, all casting fly rods, and most days we saw none of them hook up either. If anyone tells you they were crushing the big Gulf tarpon on fly this past month, I promise you they’re exaggerating. So what was the problem? For starters, the fish are really on the move out there, which is to be expected during their annual migration. Of the hundreds of schools we cast to only a small percentage were floating dead still in the water. The rest were swimming along at around 3 mph. I know this was their average speed because I was watching my GPS while chasing after them with my trolling motor. 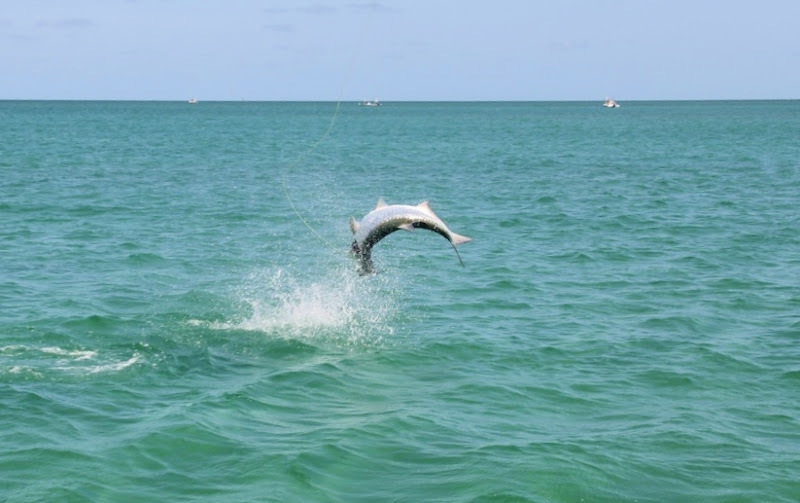 That might not sound too fast but when a tarpon is coming straight at you, combined with the drifting speed of the boat, the gap closes really quickly. The average time we had from when I'd first spot a fish until an accurate cast had to be made was usually less than ten seconds. Speaking of those casts, accurate isn't quite the right word here. Perfect is more like it. Migrating tarpon are nocturnal feeders, they're simply not as concerned with finding food during the day, but at the same time they won't pass up an easy meal. If they spot a shrimp or crab swimming just below the surface and can pop open their huge mouth to inhale it, they will. The same thing goes for a fly dropped directly in their path. Land it two feet to the tarpon's left or right and they'll completely ignore it. I've seen this behavior thousands of times over the past two decades and even though it no longer surprises me, it still drives me absolutely insane some days. So what this all boils down to is that the angler has at best a ten second window to make a cast from a moving platform through moving air into moving water at a moving fish, then land the fly in a narrow rectangle no closer than two and no further than four feet from the fish's nose, and begin stripping the fly so it is slowly moving away from the fish to accurately simulate prey and trigger a strike. Sound's easy, right? Several years ago a grown man broke a $600 fly rod over his knee on the bow of my boat in sheer frustration after one too many blown shots at cruising tarpon. It was a childish and borderline insane thing to do but something I totally understood after the day he was having. I told him that when I saw him the next morning in my bathroom mirror, and reminded him about Sage’s lifetime warranty, too. If you do manage to put it all together, these tarpon will eat. They're a big animal and they need a lot of food to keep them moving and they can be caught on fly at any hour of the day, even off a very busy SW Florida beach. The photo below is of a hundred pounder caught at high noon on a Saturday prove it. They're just a lot more unforgiving when the sun is shining. My advice is to lather up the sunblock, stay out there, and practice, practice, practice. I had a blast fishing with my friend Capt. Mike Bartlett last weekend and if you're heading to Key West do yourself a favor and call him at 305-797-2452 to book a trip. I took almost 500 photos during the two days I was down there and here are a random handful of my favorites. Waiting for the tarpon at sunrise in Calda Channel north of Key West. Plenty of rolling tarpon but none wanted to eat my flies. No luck with tarpon so we moved on to permit and bones. Capt. Mike's highly classified fly box. The best looking fish on the flats. A nice ten pound permit for yours truly caught on a live crab. Hunting for bones near the Snipe Keys. Mike hooks up with a five pound bonefish. One for me. The 85 degree water and falling tide was perfect for cruising fish one the white sand. This bonefish gave me one of the longest runs I've ever experienced. It dumped at least 200 yards of backing from my reel. My Tibor Everglades reel in this photo is fifteen years old and has landed more than 500 bonefish in its lifetime. Another hook up for Mike. Capt. X hates showing his face and refuses to publicize his business, too. Bonefish are really great looking, too. The Marquesas are a group of islands 24 miles west of Key West. I haven't been there since I left the Keys in 2005 so I was really happy to see them again, especially since we'd be running out on Capt. Mike's excellent Beavertail BT3. This boat made the long crossing a hell of a lot more tolerable than any other skiff. The fishing was a little slow but the Marquesas are still a beautiful as ever. One of the first things we came across was this long abandoned Cuban refugee boat. It made a very stable fishing platform but I wouldn't want to pole it. The Gull Keys in the Marquesas. Mike's first catch was a nice bonnethead shark. Mine was this less than legal yellowtail. A nasty thunderstorm chased us to the beach and eventually back toward Key West. Before we went in Mike stopped at a patch reef to pick up dinner. Several small grouper came up but we were after snapper. We brought home a half dozen legal grays.